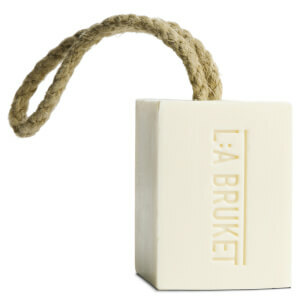 Cleanse and moisturise your body with the L:A BRUKET No. 009 Soap on a Rope 'Lemongrass', a mild, handmade bar of soap that utilises natural, organic ingredients to effectively clean and soften your skin. Formulated with a host of nourishing vegetable oils and essential oils, including Lemongrass and Rosemary, the moisturising soap works into a gentle lather; it delicately cleanses away dirt and impurities, leaving sensitive skin feeling comfortable, soft and protected. Lemongrass feels cooling and stimulating on skin whilst delivering astringent and antiseptic properties to leave the body feeling refined, purified and healthy.